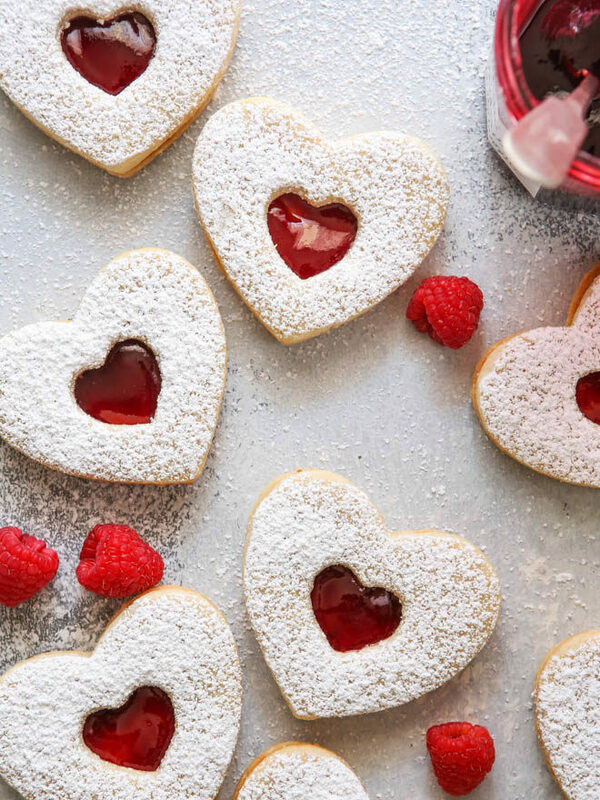 These heart-shaped almond cookies sandwiched with raspberry jam make such a beautiful treat! Come on, you guys knew I had a heart-shaped dessert coming! How could I not, with Valentine’s right around the corner? These raspberry almond linzer cookies are delicate and dainty, but it’s not all about their looks. The combination of almonds, lemon zest, and raspberry jam is just wonderful. 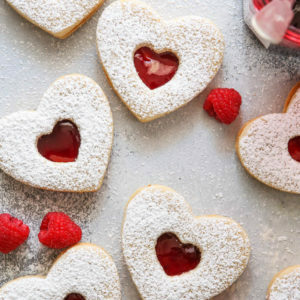 More like little cakes than cookies, these linzer cookies would be star of any Valentine’s Day party, and they’re also perfect for gifting! You can easily change the shape and even use a different flavor of jam to create any look you’d like. These linzer cookies are an adaptation of the linzer torte , a traditional Austrian dessert. It’s composed of a pastry bottom flavored with ground nuts, lemon zest, and cinnamon, a layer of jam, and a lattice made from the same pastry. The cookies have many of the same ingredients and a similar flavor profile, but are just presented in a different way. And who doesn’t love cookies? Shape cookie dough into a disk about 1 inch thick before chilling. If necessary, shape into 2 disks. Let chilled dough rest at room temperature for about 15 minutes before rolling. This will make rolling easier and reduce cracking. Make sure your work surface is well floured to minimize sticking. While you roll out the dough, lift and turn it every now and then to make sure there is no sticking. Use a bench scraper if needed to unstick dough. Cut shapes as close together as possible to reduce scraps. Gather all scraps together and knead into a ball. Shape into a disk and chill for 20 minutes before re-rolling and cutting. If you’re worried about your cut cookies spreading in the oven, freeze on the sheet pan for 15 minutes before baking. Pulse nut in a food processor until finely ground. If using almond flour, skip this step. Combine almonds with flour, and salt. Set aside. In the bowl of an electric mixer fitted with a paddle attachment, cream the butter and sugar together until light and fluffy. 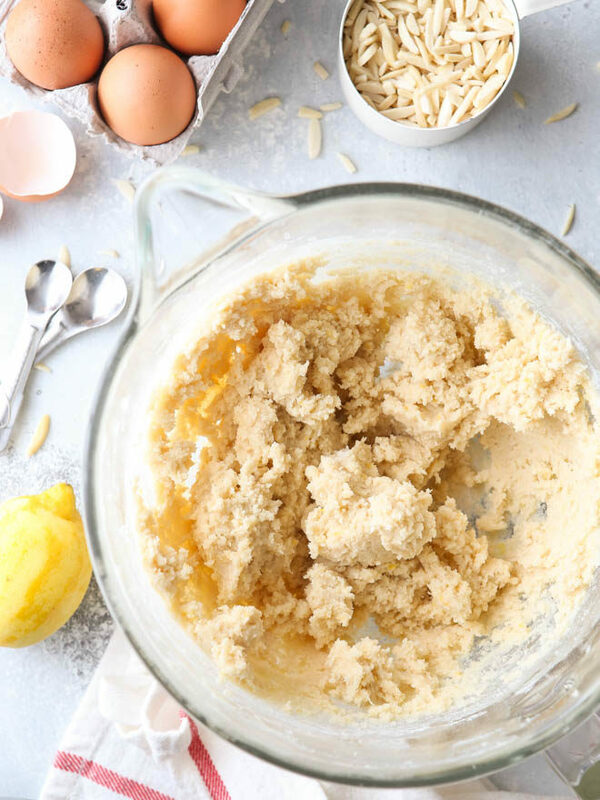 Add the egg, vanilla, almond extract, and lemon zest and mix until combined. Add the flour mixture and mix until just combined. Shape dough into a disk, wrap in plastic wrap and chill in the fridge for at least 1 hour and up to several days. You can also double wrap and store in the freezer for a month or more. When ready to make the cookies, let the dough disk rest at room temperature for about 15 minutes. On a floured surface, roll out to 1/4 inch thick. 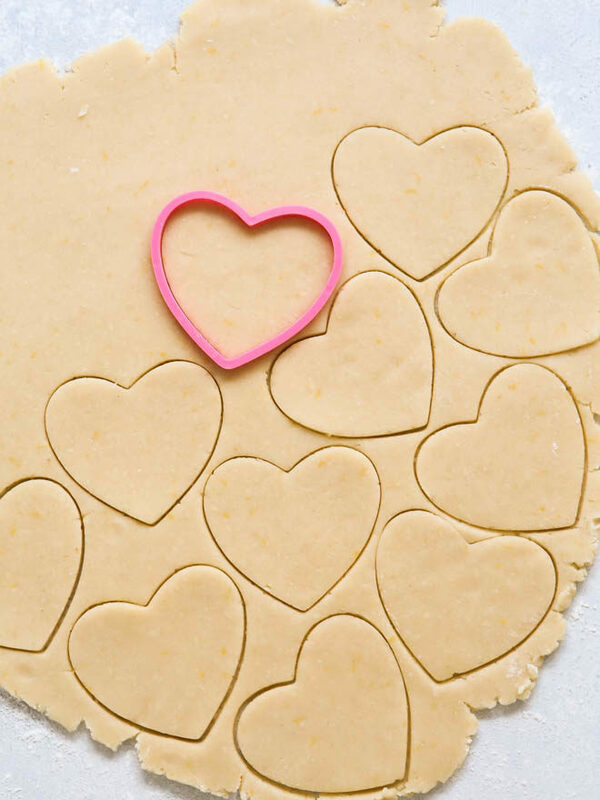 Use cookie cutters to cut dough into hearts or other desired shape. Use smaller cookie cutters to cut small windows into half of the cookies. Place cookies on a baking sheet lined with parchment paper. It's best to bake the cookies with the windows and those without on separate sheet pans for even baking. The ones with the windows will need slightly less time. Bake for 12-14 minutes or until edges just start to turn golden brown. Do not over bake. Let the cookies cool on a wire rack completely. Meanwhile, warm the raspberry jam over low heat to a spreadable, lump-free consistency. Once the cookies are cooled, use a fine mesh strain to sprinkle the top cookies (the ones with the windows) evenly with powdered sugar. 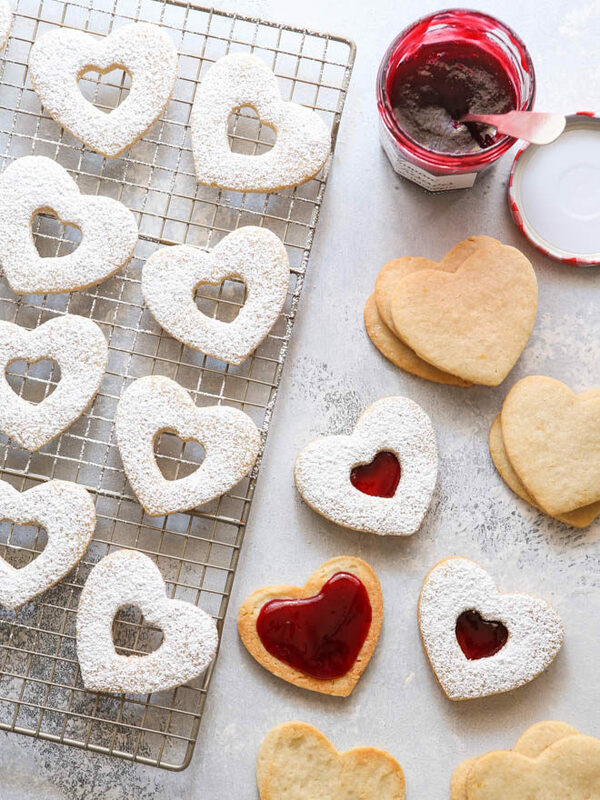 Turn the bottom cookies over and pour a spoonful of jam onto each cookie, spreading it evenly. Careful not to smudge the powdered sugar, place a top cookie on top of the jam and press lightly to sandwich together. These cookies look their best served right away, but will keep in an airtight container on the counter for several days. To remove seeds from jam, warm over low heat to thin it out. Then pass through mesh strainer and discard seeds. Adapted from Joy of Baking .